Rural Reconstruction Nepal (RRN) is a Nepalese non-governmental development organisation working in the areas of forestry, agriculture, integrated community development, human rights, peace building and social justice, having strategic focus on protecting and promoting economic, social and cultural rights and right to development. RRN, in a joint venture arrangement with Forest Action Nepal, is implementing Multi-Stakeholder Forestry Programme (MSFP) in Dhankuta,Tehrathum,Bhojpur and Sankhuwasabha districts of Nepal. The MSFP is one of the prominent initiatives of the government of Nepal which is funded jointly by the Government of Finland (GoF), Swiss Agency for Development and Cooperation (SDC),and UK Department for International Development (DFID). 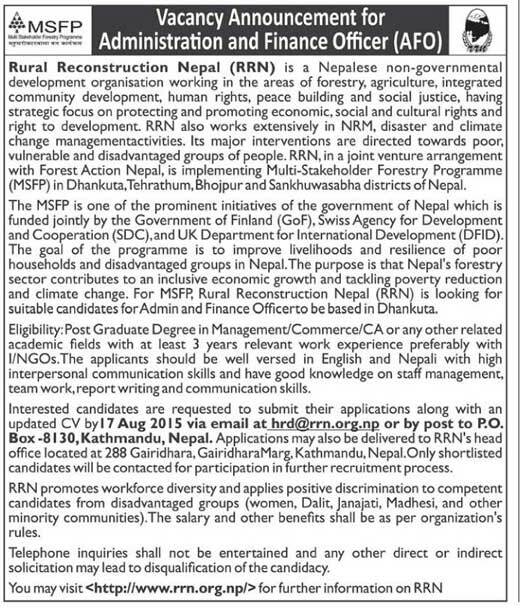 For MSFP, Rural Reconstruction Nepal (RRN) is looking for suitable candidates for followng position. Job Location: Based in Dhankuta. Eligibility: Post Graduate Degree in Management/Commerce/CA or any other related academic fields with at least 3 years relevant work experience preferably with UNGOs.The applicants should be well versed in English and Nepali with high interpersonal communication skills and have good knowledge on staff management, team work, report writing and communication skills.